The history of silversmithing in the southwest among the aboriginal people began with the northern expansion, and colonization efforts of the Spanish. Metallurgy, and silversmithing were skills learned by individuals who would have been assisting Spanish blacksmiths, and other tradesmen. The people of the eastern pueblos in what is now known as New Mexico would have had the earliest, extensive contact with the Spaniards. As silversmithing traveled among the various pueblo peoples, and the Navajo, each group developed distinct styles, and techniques. Many spanish design motifs that were introduce to early silversmiths are still prevalent in contemporary southwestern silver work. I originally learned silversmithing from Lawrence Saufkie, and Michael Kabotie, who were both innovators in the Hopi overlay style of silversmithing. Recently I began learning an earlier style of silversmithing also called whitesmithing, or tinsmithing. When silver is forged, and worked cold by hand these terms are often applied to the process. 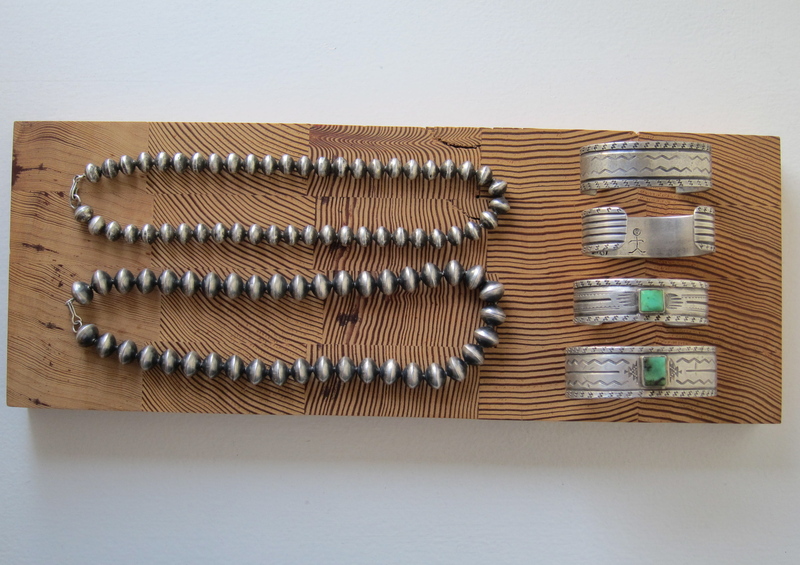 A majority of early Navajo silver jewelry was made of melted coins. Coin silver is generally 90% silver, and 10% copper alloy. Serious collectors value the earlier process of casting coin, making contemporary work made of coin more desirable. To make silver ingots I melt coins, or sterling scrap. The material I use to cast ingots in is Tufa. Tufa is a sedimentary layer of rock that occurs in northeastern Arizona. Tufa occurs all over the world. The Tufa found in the high desert of northeastern Arizona is especially fine, free of foreign debris, and easily carved. Once the desired form is carved in the stone, silver is heated until molten in a crucible, and poured into the mold. The rough ingot is then filed, and cold forged on an anvil. When the ingot resembles the desired shape, design work is laid out, and stamped into the silver.